The publisher already expects to make less money than the same time last year, but how much less would appear to depend on Sony. Activision is the latest publisher to come out and admit that the ongoing issues with PSN are causing problems. 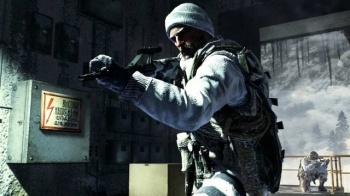 Speaking during a recent earnings call, Activision Publishing CEO Eric Hirshberg expressed a concern that the outages would lead to a delay in the next batch of Call of Duty: Black Ops DLC for the PS3. Hirshberg said that Activision was hopeful that Sony would resolve the issues with its online network before its planned release of the Escalation pack on the PS3 and PC. The pack, which is already available on the Xbox 360, is scheduled for release later this quarter. Recent comments from Sony's Japanese spokesperson, Shigenori Yoshida, suggested that Sony's deadline for restoring the service was May 31st, but Sony's Patrick Seybold has since refuted this idea, saying that there was no such deadline. Activision's COO, Thomas Tippl, said that the publisher was already expecting to see reduced income compared to last year, thanks to the loss of "high-margin revenue" from PS3 downloadable content. The degree to which the outages will affect revenues is hard to gauge however, as not only does it depend on when PSN comes back on line, but Activision also has a smaller roster of titles compared to the same time in 2010.